Chris’s passion for the culinary arts began at a very early age, apprenticing under the watchful eye of his father. French classically trained in England followed by a 3 year apprenticeship at a country house hotel inspired him to travel the world, exploring a multitude of cuisines and ultimately leading him to develop his own imitable style. He emigrated to Canada in 1996 and started his new life as a chef at Seasons in the Park in Vancouver. 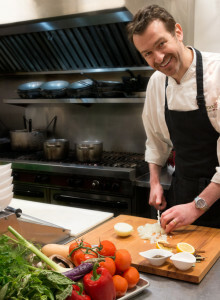 With the birth of his ﬁrst child in 1998, he moved to island life on Gabriola and led the kitchen at the Wesley Street Cafe in Nanaimo, winning various awards for his ﬁne cuisine. A short stint back in the UK saw him developing his skills further, opening multi-million dollar restaurants and bars and leading them to success. But his heart was on the West Coast and so he returned to Gabriola with his family and opened Woodﬁre in 2010. Whilst his style and cuisine may have changed and developed over his 30+ years as a chef, his philosophy remains the same. Using fresh quality ingredients, letting the ﬂavours speak for themselves combined with pure passion for food is the secret to his success.